At 1705 Zebra on 19 July 1943 USS BARNEGAT received word that Plane No. 5, Patrol Squadron SEVENTY-FOUR, had attacked a submarine in Latitude 270 30' South, Longitude 470 55' West, and that about twenty (20) survivors were in the water. Preparations for getting underway were started immediately and at 1800 Zebra BARNEGAT was underway to proceed to the scene. The delay was unavoidable due to necessity of recalling ship's boats and leaving services and gasoline for the two planes of the detachment. Best possible speed was made in an attempt to reach the scene prior to darkness but this turned out to be impossible when a second position report placed the position about 55 miles to the north and east of the original position. No trouble was experienced in reaching the scene, over which a plane was circling, and the ship proceeded directly using RDF and radar. The position was reached at 2146 Zebra, about an hour after sunset and an hour and a half before moonrise. Correct position was 270 17' South, 470 32' West. Darkness rendered the locating of the raft very difficult and slow circles were made in the area until SL Radar picked up a small target a mile and a half away. This Bearing was run down and at 2215 Zebra a raft was sighted dead ahead with seven survivors in it. All survivors were aboard by 2250 Zebra. Search was continued for possible additional survivors until 0100 Zebra, 20 July, at which time search was discontinued and BARNEGAT returned to base. Additional plane search of the area the following morning revealed a capsized life raft and two life jackets but no signs of life. The first five prisoners brought aboard were enlisted men and no segregation was necessary. They were placed immediately under armed guard, taken below to the mess hall and kept separated from the ship's company. As soon as they reached the mess hall they were searched, everything taken away from them and placed in separate envelopes and they were then stripped. Stripping was necessary as their clothes were wet and oil soaked. Names and rates were obtained at this time. After being given coffee and a hot bath they were placed in a separate compartment under armed guard where they received medical treatment. All were suffering from shock and miscellaneous injuries. No attempt has been made to question these prisoners and they were kept segregated from the ship's company and held incommunicado. Each prisoner was issued underwear, a suit of dungarees, and rubber sneakers. They have been constantly under armed guard and at no time have seen or talked to the officer survivor who is their Commanding Officer. The last two prisoners, making a total of seven, were brought aboard approximately twenty minutes after the first. The raft had broken loose after the first five came aboard (the fifth man, who was apparently tending the line, brought it aboard with him) and a second approach was necessary. Considerable difficulty was experienced in getting the last two out of the raft and onto the gangway due to the state of the injuries and the motion of the ship and raft. Both of the men were taken immediately to sick bay and have been kept there since under armed guard. All possessions, including clothing, were taken from them and their names and rate ascertained. One was the Commanding Officer of the submarine and the other an enlisted man. Both have been held incommunicado and at no time have seen or talked to the other five prisoners. It was quite impractical to keep the officer survivor separated from the one enlisted man due to the crowded condition of the ship and the state of their injuries. An armed guard has been with these two continuously and has prevented any conversation between them. However it is the intention to keep this one man, who has been in sick bay with his Commanding Officer, separated from the other five so as to prevent any possibility of information or instructions being passed to them, and it is respectfully suggested that this procedure. An attempt was made to obtain as much information as possible from prisoners by listening without any interrogation and that obtained is submitted below. (a) He was commanding officer of the submarine. (b) Name - Fritz Guggenberger, age 28. (c) Rank : Captain Lieutenant (Lieutenant Commander). (d) That he joined the Navy in 1934 and took a world cruise after which he returned to the Naval Academy where he spent three years. (e) Married and has a son age 1-1/2 years. (f) While giving the above information he remarked: "We have no desire to fight the Americans". G. Do you speak English? G) This bed feels good. Thanks for the blankets. (Because of exposure and injury a syrette of morphine was administered). G. That is very practical (referring to the syrette). G. Is this an aviation ship? G. Was the plane American too? G. The plane showed great courage in attacking us. Captain Lieutenant Guggenberger showed considerable surprise when he learned that the ship and the plane were American and wanted to know if the ship that rescued them was connected with the plane that sank him. He showed surprise that the U.S. Navy was operating so far south and stated that he stayed surfaced to fire at plane assuming it "was Brazilian and would turn away". He wished to thank the Commanding Officer very much, presumably for saving his life. Captain Lieutenant Guggenberger told the Executive Officer that his men were "only supposed to tel their names and rates" and displayed concern presumably that they were talking. He also asked to be permitted to see them all and, of course, this was refused. 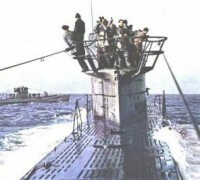 In connection with the submarine skipper's evidenced surprise that it was an American plane that had sunk him the point is brought out that he had been in a rubber life boat for approximately four hours before being rescued. This boat and numerous other articles had been dropped by the plane and most of them were clearly marked "U.S. Navy", thus why he should show surprise is not understood. During this four hour period he had plenty of time to caution his men as to security and to get rid of any 'evidence'. (a) Impression given that they had enjoyed a liberty recently (talking about girls, wine, champagne etc.). Then talk shifted to 'back home'. (b) Had not been here very long and were surprised to see plane as did not expect any in this area. (c) Mentioned other 65 men that were left in submarine. (a) When the first line was gotten to the raft the prisoners started to sing. The song was not recognized. (b) Among the possessions of one of the men is a photograph with the address of a photographer in Lorient, France. (c) The men use often the french expression "Compre". (d) The skipper mentioned he had been in submarines since the start of the war and had expected to finish the war in submarines. He had seen considerable activity in the Mediterranean and thought the Italians were fine comrades, - people of culture. (e) It is noted that the underwear worn by the sub skipper bore the name "Peterson". 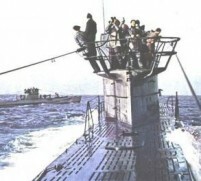 (a) The S.S. SUMARE (skipper is now in jail in Santos), a large motor launch, usually engaged in carrying oil and gas in drums along the coast, is said to have been boarded by a submarine about the 14th of July, location unknown, and robbed of all its diesel oil. (b) About 30 June the S.S. DOVA sighted a sub at night off Caparra Bar. An Argentine merchant ship of about 800 tons was in the vicinity. The only Argentine merchant ship believed to have been in the vicinity was the EL RIO PLATENSE. (c) Survivors of the S.S. RICHARD CASWELL were picked up by this ship on 22 July 1943 in approximately the same area where the submarine was sunk. The RICHARD CASWELL was torpedoed on 16 July 1943. (a) Location of U-boat on the night in question.